Once you unbox the PlayStation 4 you bought today, you can connect it to the Internet and watch the console transform into a social gaming experience with built-in Facebook integration. Facebook has worked with Sony in the past on tie-ins with the PlayStation 3 and PlayStation Vita, but the social network's integration with the PS4 goes deeper than before. "It used to be up to the individual game to do integration," said Facebook engineer Colin Creitz, who led the PS4 project. "Now the PlayStation 4 comes with a 'share' button right on the controller, which allows you to share stills and screenshots as well as gameplay video. It also allows live broadcasts. It goes beyond Facebook integration, as proud as we are of that." Sony has emphasized the PlayStation 4's sharing capabilities since day one. During its February announcement event, the company said the console's online network would be based on real-life relationships--including real names and real photos--a departure from the gaming norm. The Facebook login is optional at setup, and you can change your sharing settings if you want to go off the grid. 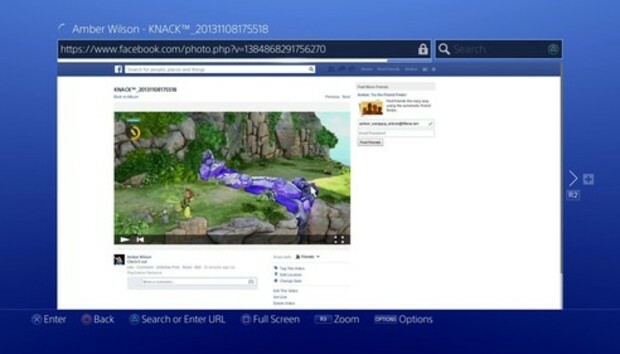 Facebook is offered up to PS4 gamers as soon as they connect the console to the Internet. You can log in with your Facebook account, which imports your name, profile photo, and friends. Everything is opt-in, and you can easily log out. So why would you want to connect your Facebook account to your new console? So you can share what a badass gamer you are, obviously. You can take stills or video clips of your gameplay and share them on your Timeline. Creitz is excited to see how gamers take advantage of the live broadcast option. Facebook connected with live-streaming site Twitch TV so PS4 owners can link to livestreams of their gameplay on the social network. Game developers will be able to further integrate Facebook into their games, so one day your Facebook friends might be able to guide you as you play. "I'm curious to see what developers choose to do," Creitz said. It's unclear whether the Colin Creitz 4 is the only Facebook-laden console to launch this fall. Creitz declined to say whether the network worked with Microsoft on the Xbox One, which hits store shelves Nov. 22.